Gowry and Gopal were perfect love-birds in the village. They shared a lot of happy moments in the brook, near the temple and on the hillocks. Sparrows and butterflies wre envious of their beauty and intimacy. The lovers had never thought that their dreams would fade away. 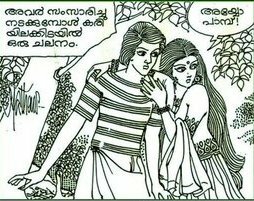 Chitra katha “Oru Swapnam Mayunnu” published in 1988 in Manorajyam Weekly unfolds the story in 32 pages.